French Women read books. Real books, made with paper and ink! But with a real book, you might tuck inside a pretty yellow maple leaf that you found on your walk earlier in the day. 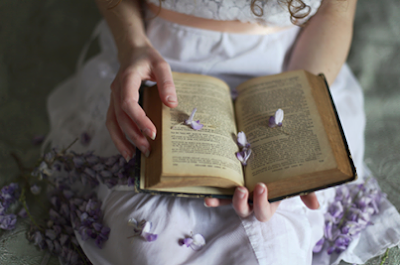 Or you could press a delicate wild flower inside the middle of your beloved book. Perhaps you might slip a secret letter in the page with your favorite poetic passage. Then, there's the possibility that years might pass before you pick up the book once again, only to discover this delicious treasure. And suddenly, your remember everything and more. The past blossoms up, right before your eyes. That's the joy of real books. Do you ever hide things in books? What do you like to put in them? I'd love to hear about it! P.S. If you're in Paris this Wednesday, I'll be speaking at The American Library in Paris! Between the pages of my favorite novel (The Ladies of Misalonghi), I hid the first letter my daughter wrote to me (she was 6). The envelope says "Mommy". Placing a treasured photo or card within the pages of a book always leads to a surprise when I reread the volume years later. So many times I have been pleased to re-find something I thought was lost. Including a few $10 dollar bills that disappeared when I was in a hurry. Such fun.